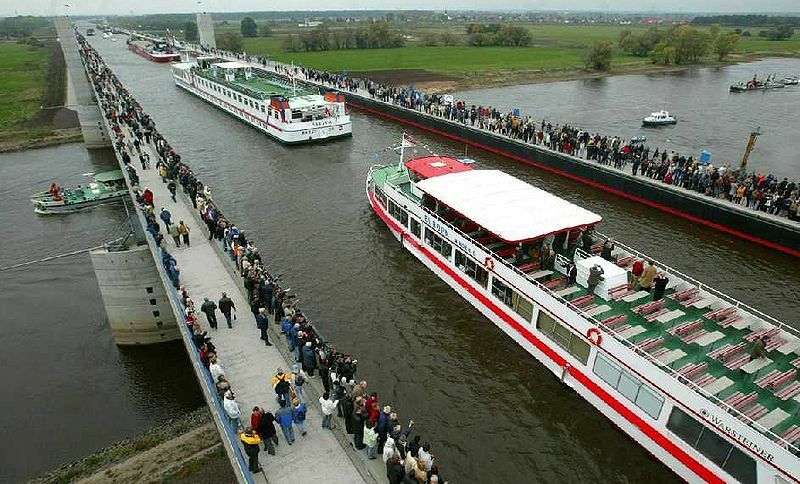 It’s not often that you’ll find a large navigable water way that is an aqueduct that is strong enough to handle commercial transportation, but that’s exactly what the Magdeburg Water Bridge does. Located in Germany, this bridge spans the Elbe River and allows commercial water transportation to cross without the use of locks. It’s located about 100 miles west of Berlin and it connects two different canal system. The initial concepts for this water bridge were started as early as 1905 and work continued on the project through the start of the second world war. It wasn’t completed, however, until 2003. What makes it truly unique, however, is the fact that it is a water bridge that crosses water, making it one of the world’s most amazing bridges. How does the engineering work for this bridge? After all, isn’t water displaced when large, heavy objects go through a contained space? This is why the bridge itself is so long, measuring out at over 3,000 feet. The entire length of the bridge helps to control the water displacement so there isn’t any major splashing happening. You can even walk alongside the bridge if you wish on two built-in pedestrian ways! It may have been a €500 million investment, but the value in connecting Berlin’s inland harbors with the ports along the Rhine is invaluable to the nation is immeasurable. It’s also one of most unique bridges you’ll ever see!